Yesterday, students began discussing their book club books independently. I always circulate among the groups eavesdropping and occasionally participating in their interactions, but I can’t be everywhere at one time. That’s as it should be. My book club research over the years, which began when I was still teaching high school, has been focused on how students go it alone when they select books they’re interested among a range of books I’ve chosen because they are connected to our course concerns. Often these books are controversial in some respect, and even when they aren’t visibly so, students’ independent interactions apart from my facilitation often ensures that a wider range of perspectives as shared simply by virtue of the fact that they are discussing them in a smaller group. That always means that more students are able to participate in the conversation at hand. Norming, of course, must proceed these discussions, so students set those together; they also negotiate their own personal methods of responding to the text so that they don’t choose something they consider to be busy work, but at the same time come prepared to the group to share their ideas. 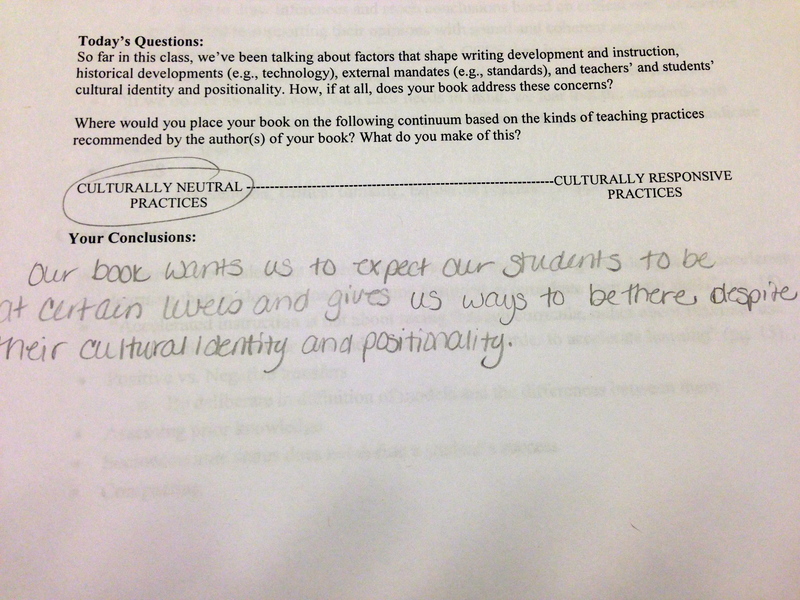 The first section requires students to assume various roles over the course of several book clubs, including leading the discussion at some point and scribing the group’s interactions. 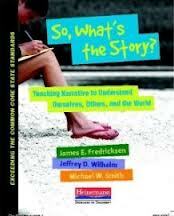 The second section is designed to help students document their interactions of the course of several weeks as they discuss the book by recording each group member’s most significant contribution to the discussion. The unspoken expectation, then, is that everyone will make one and that differing perspectives are welcome. The final section of the form–“Today’s Questions”–is my way of being at least obliquely present within the group by providing what my high school students referred to as “real questions,” that is, authentic questions that even I as the teacher haven’t quite figured out yet. These questions also allow for a modicum of continuity across the groups as everyone is inquiring into the same topic that I’ve raised because of its connection to broader course concerns. At the conclusion of each book club meeting, we make this focus evident by sharing out highlights of the conclusions groups have reached in regard to these questions in a quick whiparound. So far in this class, we’ve been talking about factors that shape writing development and instruction, including historical developments (e.g., technology), external mandates (e.g, standards), and teachers’ and students, cultural identity and positionality. 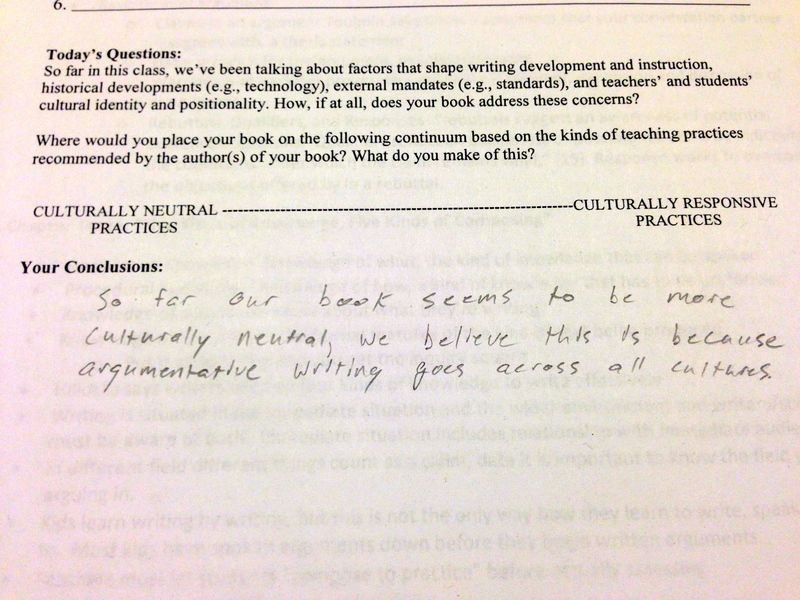 How, if at all, does your book address these concerns? Where would you place your book on the follow continuum based on the kinds of teaching practices recommended by the author(s) of your book? What do you make of this? 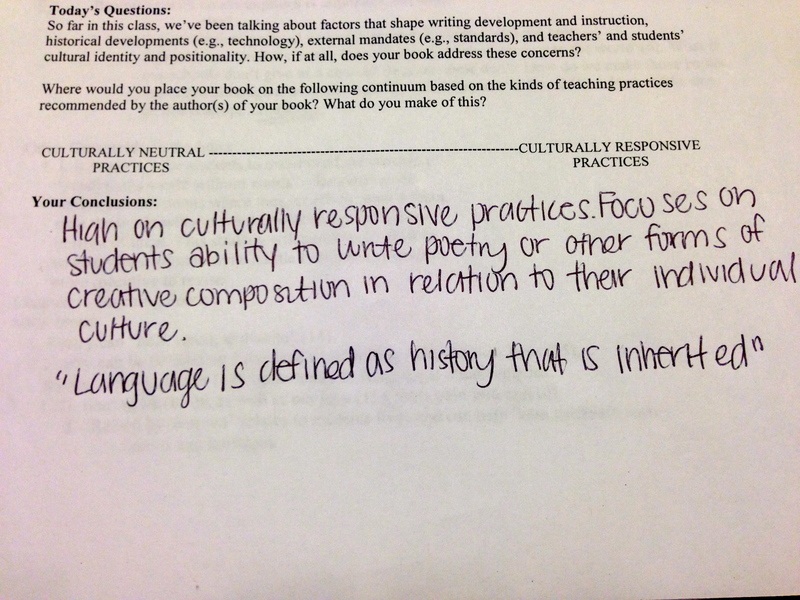 I was especially interested in their response to the second set of questions because we haven’t formally defined what “culturally neutral practices” and “culturally responsive practices” are. This, too, is be design. Though we’ve certainly been using the latter term, I want students to inductively arrive at their own definitions and to see how these evolve over the course of the semester as they explore concrete methods for teaching writing and take these up through the SOS Project. by Jake, Linda, Shelby J., Jake, and Emily T.
Again, I want to emphasize that students found the instructional methods explained in the books so far to be useful overall, so the ratings weren’t damning, and students weren’t dismissive about the books. As well, as I said, they are only about 1/4 of the way in, so it’s possible their ratings might change once they’ve finished the books. 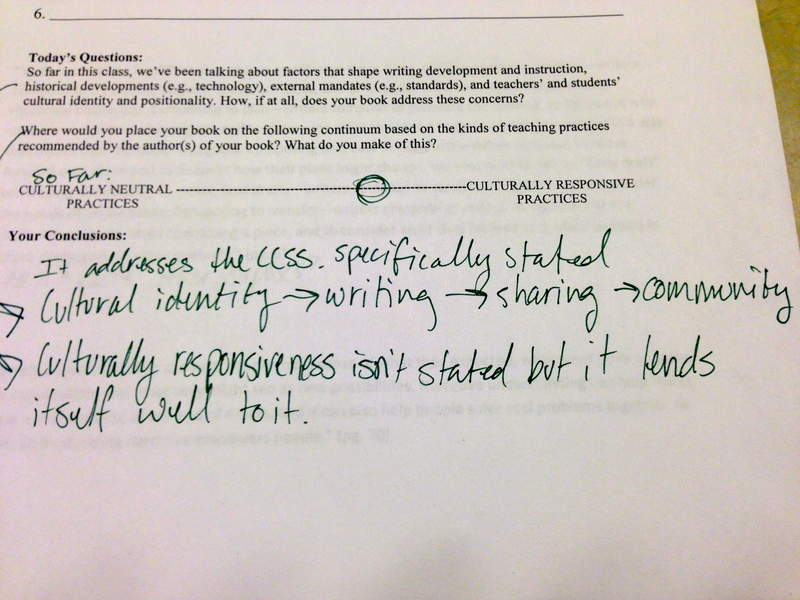 What I found to be most interesting, though, were their rationales for the ratings and their provisional thinking about the potential for these instructional methods to be adapted in ways that might actually take up a culturally responsive approach. Many educators still believe that good teaching transcends place, people, time, and context. They contend it has nothing to do with the class, race, gender, ethnicity, or culture of students and teachers. This attitude is manifested in the expression, “Good teachers anywhere are good teachers everywhere.” Individuals who subscribe to this belief fail to realize that their standards of “goodness” in teaching and learning are culturally determined and are not the same for all ethnic groups. The structures, assumptions, substance, and operations of conventional educational enterprises are European American cultural icons (Pai et al., 2006). I also want to emphasize that students could most likely make similar observations about my own first book The Book Club Companion. Early on in the book, I do contextualize the methods I recommend as “provisionally best practices” by making the point that contexts differ and students differ from year to year and sometimes even class period to class period. 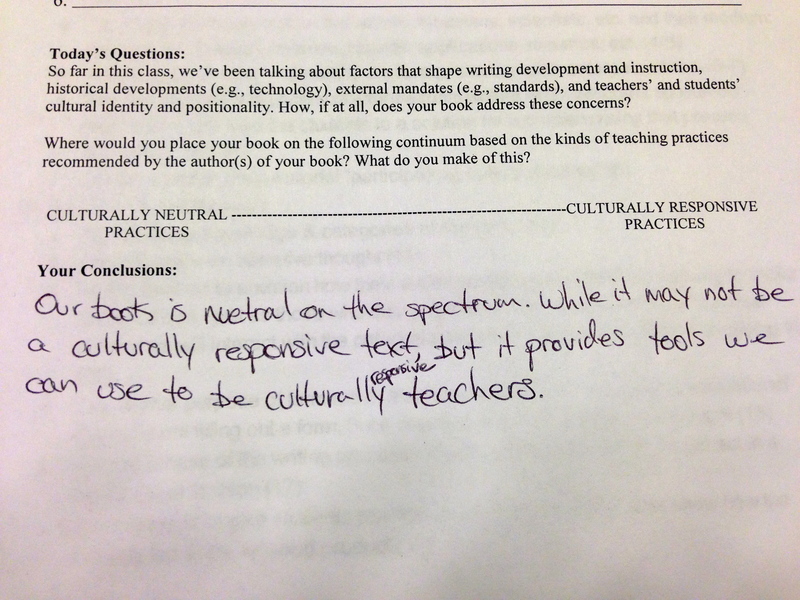 I urge readers to keep this in mind as they adapt the methods for their own teaching, but that’s about the extent of my attempt to cast the instructional approach of book clubs as “culturally responsive.” Consequently, I bet my students would rate that book as falling primarily on the “culturally neutral” end of the spectrum. I hope my second book Tough Talk, Tough Texts, would fare better since I explicitly urge teachers to pay far more attention to cultural concerns through their selection of a diverse range of books which highlight race, class, sexual identity, and so on. I also present methods they can use to help students confront the often difficult issues that arise in them in productive ways that are likely to challenge their existing world views. When books aimed at teachers implicitly assume a homogeneous student population, how might students adapt the methods to be useful for the actual kids in their classes? What are the consequences of these kinds of assumptions? What are some specific methods teachers might develop to design lessons that capitalize on their students’ cultural backgrounds and thus enrich the classroom community as a whole?